Made with potatoes instead of pasta, this tasty Roman dish is flavoured simply with cheese (cacio) and pepper (pepe). 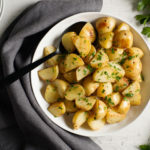 In large saucepan of boiling salted water, cook potatoes for about 20 minutes or until tender. Drain, reserving 1/4 cup (60 mL) cooking liquid. Cut potatoes into quarters; return to saucepan. Toss together potatoes, oil, 1 tsp (5 mL) pepper, and salt; stir in 1 cup (250 mL) cheese and reserved cooking liquid. Transfer to serving dish. Sprinkle with remaining cheese and pepper. Garnish with parsley. Substitute Parmesan for Pecorino cheese if desired. For an even richer dish, substitute butter for olive oil.